It’s just a week to Christmas, but the automotive world never sleeps and it is less than a month before the all-new BMW 4 Series Concept Coupe will debut at the 2013 North American International Auto Show. The BMW 4 Series Concept Coupe is the crown of an entire cycle of creation and development resulting in a unique countenance and highly individual style. 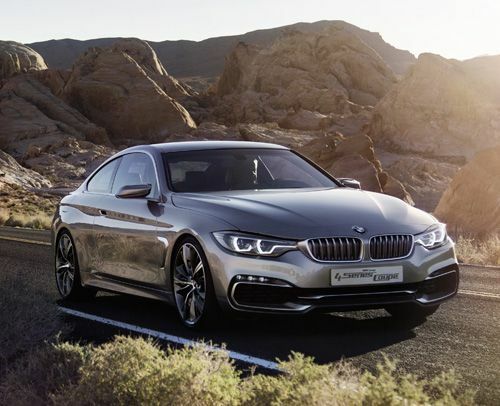 Combining genes from the BMW 6 Series and BMW 8 Series Coupes, the BMW 4 Series Concept Coupe features a marginally longer wheelbase, somewhat wider stance and a significantly lowered roofline compared to the BMW 3 Series Coupe. The concept exudes a buff, masculine phenotype that suggests forward motion even when standing still. Satin-finish aluminum trim dresses up air intakes and vents, along with door openers and exterior mirrors to add unique elegance to the overall design. The somewhat more exclusive Concept Coupe also boasts an enhanced level of sporting dynamics, reinforcing the brand’s slogan, which touts the Ultimate Driving Machine. Detroit's 106th Auto Show, the 25th under the International banner, will also be graced by the exhibit of the BMW M6 Gran Coupe that combines the performance of the M designation with the roomy interior of a four-door vehicle. Well-known M features accentuate the car’s distinguished styling both inside and out. Beneath the bonnet a V8 engine with M TwinPower Turbos connects to a seven-speed Double Clutch Transmission with Drivelogic, to produce a whopping 560 hp. The new BMW 3 Series Sports Wagon blends the performance of a BMW with the versatility of a liftback. A little larger than its predecessor, the new 3 Series Sports Wagon has noticeably more interior space and cargo volume has been boosted by 10 percent. The Wagon also comes with the award winning N20 4-cylinder TwinPower Turbo engine, achieving 10 percent better fuel economy. BMW Lines will make it the next model to allow significant customization to individual tastes, with a quartet of trim and equipment variants – the Sport Line, Luxury Line, Modern Line and M Sport Line. The new BMW Z4 Roadster will be on hand and for details of that model we refer you to the post by Torque News co-writer, Denis Flierl. Suffice it to say here, the new Z4 will do zero to 60 mph in about five-and-a-half seconds, while getting 34 mpg. Naturally, BMW wouldn’t leave out the i-concepts – the BMW i8 Concept and the BMW i3 Concept Coupe – as these will be the first electric and hybrid cars primarily made of carbon fiber to hit the market in 2013 and 2014. The BMW 4 Series Concept Coupe will be unveiled January 14, during a press conference at 11:30 am in the BMW area of the COBO Center in Detroit.